The ‘initial’ law of life is mutual devouring in accordance with the Upanishadic formula that ‘the eater eating is himself eaten’. This formula is reflected in the metabolic interplay of anabolism and catabolism which maintains the harmony or homeostasis of life. One could guess that this balance between anabolism and catabolism could maintain forms ad infinitum validating the possibility of immortality. But this does not happen and a point comes when the metabolic balance can be sustained no longer. Sri Aurobindo explains that though the ‘form’ is limited by space and restrained by time, it is actually the projection of the formless Infinite who is at the same time spaceless and timeless. It is therefore logical that the finite would at one point of time seek an infinite experience. When this longing crosses an optimal threshold, the form cannot support the quest for the formless Infinite and has to break down. This breaking down is not an end by itself or signals an annihilation of the world of forms. Instead it facilitates the formation of progressively new forms. 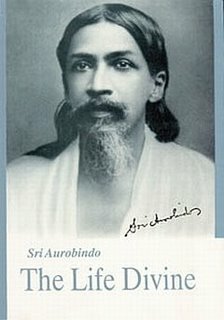 Sri Aurobindo explains that as the object of embodied life ‘is to seek infinite experience on a finite basis, and since the form, the basis by its very organization limits the possibility of experience, this can only be done by dissolving it and seeking new forms’ (The Life Divine, pg.207). What is then important is not the dissolution but renewal of forms. What is eternal is not the persistence of the same form but constant renewal of forms in the matrix of mutual devouring that maintains life in the intervals or ‘in-between’ of the renewals. This is the law of death. If the form collapses, does all its history, its experiential insight, its repertoire of memory gets effaced? All experience is stored as acquisitions in Time in the subconscious of the Timeless, in the cosmic memory, in Akashik records and provides the foundation of future experience. The purpose of the universe is endless growth and every experience adds to the ever-expanding experiential play of the multiverses. ‘For the soul, having once limited itself by concentrating on the moment and the field, is driven to seek its infinity again by the principle of succession, by adding moment to moment and thus storing up a Time-experience which it calls its past; in that Time it moves through successive fields, successive experiences or lives, successive accumulations of knowledge, capacity, enjoyment, and all this it holds in subconscious or superconscious memory as its fund of past acquisitions in Time’. (Ibid, pg. 207). It is only a constant succession of forms that can enrich, expand and explore all Time-experiences through Time-successions; ensure a constant variation of experiential-knowledge. ‘To this process change of form is essential, and for the soul involved in individual body, change of form means dissolution of the body in subjection to the law and compulsion of the All-life in the material universe, to its law of supply of the material of form and demand on the material, to its principle of constant intershock and the struggle of the embodied life to exist in a world of mutual devouring. And this is the law of death’. (Ibid, pg.207-208). If Death serves such a glorious purpose, why do we look at it with disdain, why do we shudder at its very name, why do we feel defeated with its triumph? Ordinarily, we do not know to die gracefully. A graceful death needs a long preparation. The Tibetan Buddhists perfected the techniques of conscious death. Padma Sambhava, the great Master had composed the Tibetan Book of the Dead in the eighth or ninth century for initiates. There is also the phenomenon of Willed Death or Icchamrityu sanctified in the Indian tradition. One can voluntarily and freely choose to abdicate life instead of suffering the ignominy of compulsion and loss of liberty at the hands of Death. There is another possibility worth considering. What if immortality and expansion of experience could happen in a way surpassing the phenomenon of death as we know it today? That is the issue which Sri Aurobindo deals with in his epic, Savitri.